There are hundreds of VR headsets available for your Android smartphone. You can find cheap ones (Google Cardboards) for around Rs. 250 and more expensive ones like Samsung Gear VR for around Rs. 7000. 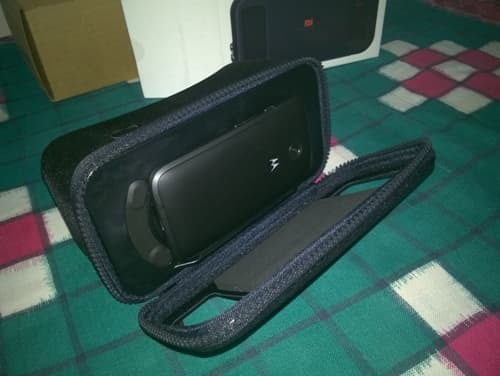 If you are looking for a VR headset, that is not too expensive but still offers you the best VR experience on mobile, then your best bet is Mi VR Play. Just like Xiaomi does it with its smartphones, it has done the same with its VR headset. The Mi VR Play headset is relatively cheap but does not skip out the premium features. 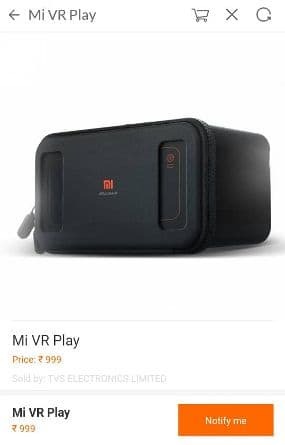 The Mi VR Play costs just Rs. 999 and is available for purchase on the Mi Store. The Mi VR Play is available intermittently on the website and before we tell you more about the product we shall tell you how you can get it when it comes in stock. How To Purchase Mi VR Play? 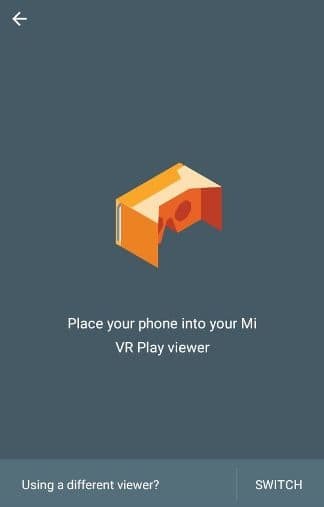 Since the Mi VR Play is available only on the official Mi website, you cannot purchase it elsewhere. As the product goes out of stock almost as quickly as it arrives on the store, you need to set up an alert. You can do this in two ways. First you can click on the “Notify Me” on the product page. When the product comes back in stock you are sent an email informing you about the same. However we shall recommend you go for the second way. In the second method, you need to install the Mi Store app on your Android smartphone. In the Mi Store app you are immediately notified about the sale of a product. The best part is that with one-tap on the notification you can add the Mi VR Play to your cart and purchase it within the next 15 minutes. 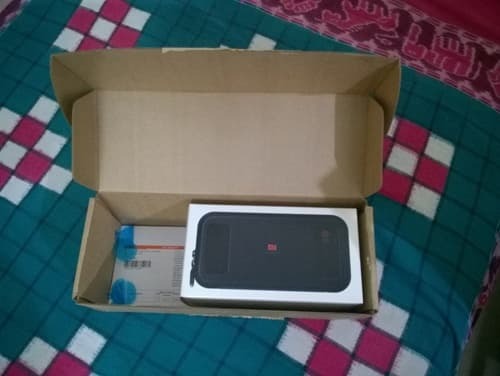 The Mi VR Play is shipped in a rectangular brown box usually through Fedex and it arrives at your doorstep within two working days of order confirmation. The brown box contains the Mi VR Play and the invoice. 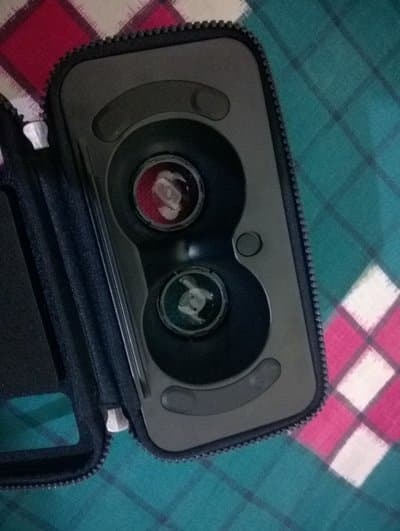 Once you open the seals on either side of the white box you can take out the Mi VR Play. Inside the Mi VR Play you can find the user guide which is in English and Mandarin. The Mi VR Play lenses are covered with removable transparent blue stickers in order to protect the lens. They can be removed with ease before you start playing with the product. How To Setup Mi VR Play?/ How To Use Mi VR Play? First things first we need to make it clear that the Mi VR Play accepts Android and iOS smartphones which are between 4.7 to 5.7inches. This means smaller Intex smartphones and larger phones like Mi Max are incompatible with the Mi VR Play. There are also some software hurdles in place too, you need to be on Android 4.1 or above and iOS 8.0 or higher. Another additional requirement to fully enjoy your VR experience is the presence of gyroscope sensor on the phone. Most VR apps including the basic Google Cardboard app requires gyroscope sensor for the app to install. 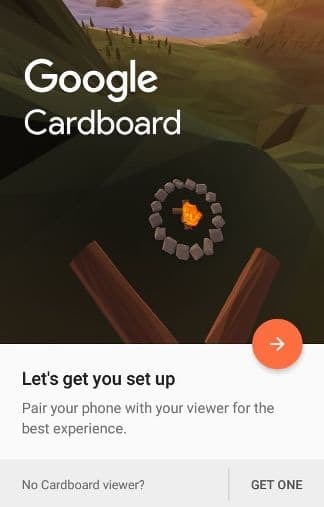 Firstly you have to install the Google Cardboard app on your phone. You can do this easily by scanning the QR code on the user manual with any QR reader app on your phone. 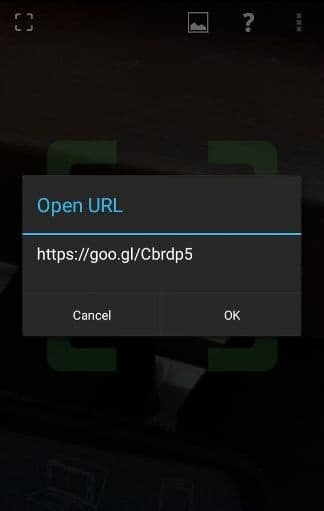 This opens Chrome browser on the smartphone from where you are redirected to the Google Play Store website to install the Google Cardboard app. Once you install the app, you have start the app from the menu. Once you start the app you encounter the following screen stating to set up your viewer. Next you have to pair your Mi VR Play with the Google Cardboard app. Here you have to again scan the same QR code that you find on the user manual. Once the pairing is complete you will see the following screen. Then you have to place your phone into the Mi VR Play viewer. To help you out you can align the phone according to the arrow mark located in the inside of the Mi VR Play. Next on the screen comes the tutorial of Cardboard experience on the phone. Sadly we cannot put up more screenshots as they are in VR mode and would make more sense if you viewed them on the Mi VR Play. How is the Indian Version of Mi VR Play Different from the Global One? If you have looked at the un-boxing shots of the Mi VR Play then you would have noticed that it is missing something. If you look at our coverage of the Mi VR Play launch back in August last year, you can notice from the press shots that the international version of the Mi VR Play has a head strap with which you can enjoy VR content hands-free. Sadly the Indian version of the Mi VR Play does not have a head strap. 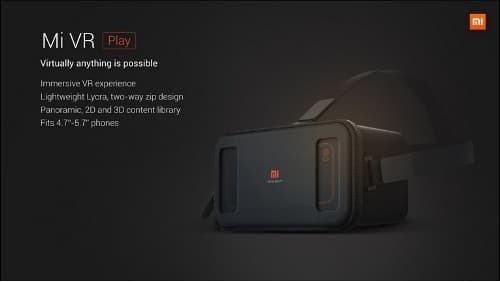 Xiaomi say that “Mi VR Play follows Google's recommendation that cardboard device designs do not include a head strap”. This is a big letdown as compared to the International version which has the head strap in the retail product. The head strap would have been useful for VR gaming sessions with a Bluetooth controller. Another difference of the Indian version is that the Mi VR Play only comes in Black colour. 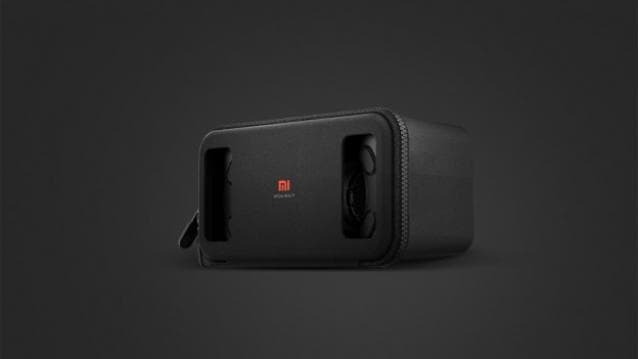 During its launch announcement Xiaomi was perhaps the only company to reveal multi-coloured designed sets, even before Google did for its Daydream viewer. How does the Mi VR Play perform? The Mi VR Play is built out of Lycra which is an elastic polyurethane fibre. This makes the Mi VR Play robust and light weight at the same time. The Mi VR Play weighs 208 grams only. 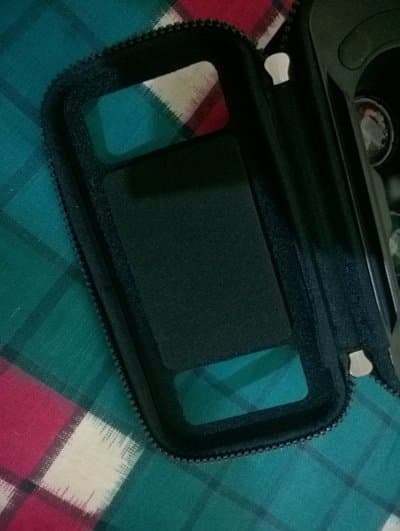 Instead of having to secure your phone by sliding it in, the phone is locked in position with help of rubber strips. The rubber strips are not only built for strength but they also make sure that no accidental presses (of capacitive buttons) occur while the phone is encased within the Mi VR Play. There is also a big slab of rubber on the opposite end to cushion your phone. While other VR headsets require a magnetic slider to operate, the Mi VR Play relies on a button which is located on the top in the right hand side. This button is connected to a small round shaped conductive silicon button that is used to interact with the VR content. 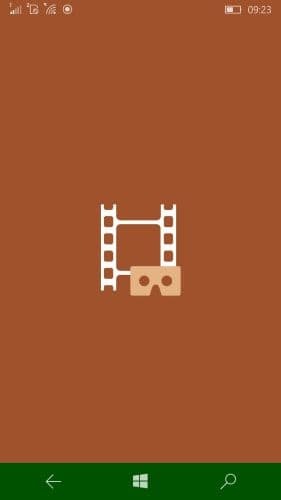 For example during the demonstration session of Google Cardboard it was helpful in selecting virtual objects on the screen. Another unique feature of the Mi VR Play is that it has dual front openings. These openings are useful in two ways. The first way is that it allows opening for the camera lens. This helps you enjoy Augmented Reality content and use the Cardboard Camera app to take 360 photos. Secondly it helps dissipate some of the heat generated by the smartphone during its operation. While we liked the two-way zipper system of the Mi VR Play, it began to dawn upon us that it would make it difficult to put in earphones. We figured out a way by carefully adjusting the zips allowing a small opening for the headphone wires to come out. If you wear spectacles like me, then we have some good news. Unlike the cheap Cardboard VR headsets, where your spectacles become an obstacle for viewing, the Mi VR Play accommodates your spectacles with ease. The Mi VR Play is also gentle on your eyes as it comes with optical-grade aspheric lenses which are far better than the plastic lenses you find on cheaper VR headsets. A word of advice, do not use the Mi VR Play headset for prolonged periods of time as it may cause headache and strain on your eyes. Just like any fun thing it is best when its use is moderated. Does Mi VR Play Work With Windows Phones? If you are a Windows Phone owner like me, chances are that you might think you are left out of the VR fun. Thankfully you aren’t due to presence of some apps on the Windows Store. A small warning though, makes sure that your phone has a gyroscope, otherwise you miss out on lot of apps and games. An app that caught our attention was the VR Video For Windows 10 Mobile. It is free to try for a day and costs Rs. 79 for the full version. 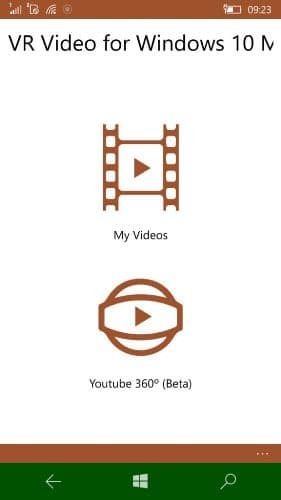 Apart from playing videos from your storage, it also has a Beta feature that lets you view 360 videos on YouTube. The excellent fact about this Beta feature is that it can perform its functions without gyroscope. Sadly the feature is buggy and crashes at times. As nerds, if you ask us which is the best smartphone VR headset in the market we are going to say it’s the Samsung Gear VR. It is the only headset that is powered by the biggest name in VR history, Oculus. The Samsung Gear VR has tons of advantages over Mi VR Play. It allows more control over VR content with the help of three hardware keys, Home, Back and a fully fledged touch panel on one side. Bespectacled creatures like us would love the focus adjustment wheel that adjusts the lenses to suit your vision. The Samsung Gear VR works best because it is linked via microUSB to the Samsung smartphone. It provides a higher field of view as compared to Mi VR Play. The former gives a field of view of over 100 degrees but the latter has only a field of view of around 70 degrees. 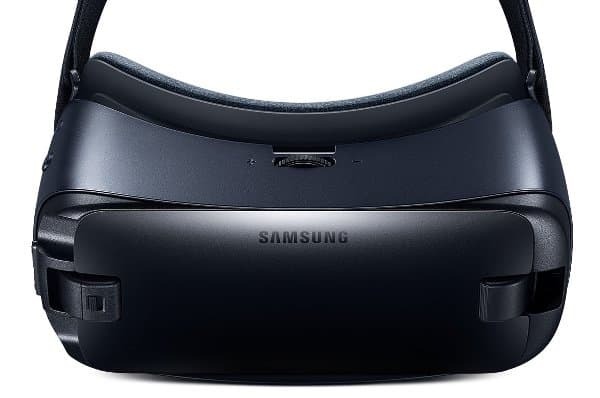 Sadly the Samsung Gear VR is only compatible with certain high end Samsung smartphones like Galaxy S7, S7 Edge, Note 5, Galaxy S6 and S6 Edge. The Mi VR Play can accept smartphones from both Android and iOS if they satisfy the size criteria of 4.7inches to 5.7inches. We looked at the higher end of the price range and now we delve into the entry level offering, Google Cardboard VR. In India, Google Cardboard VR headsets are prepared by non-descript companies and sold on questionable online retailers like EBay. We shall compare the Mi VR Play with one of such cheap Cardboard VR headsets bought from EBay. The Cardboard VR headset is flimsy and uncomfortable to use. Its lenses are made of plastic which hurt your eyes with prolonged use. You find rashes on your nose due to the friction caused by the foam at the nose covering. The Mi VR Play is far better than any of these Google Cardboard VR headsets. 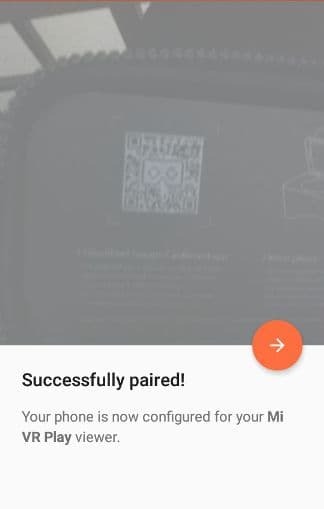 What are the common problems with Mi VR Play? One of the problems that we faced with our Mi VR Play headset was that the touch button was not registering on the display. One of the solutions we found was to take out the phone and put it back in position as tight as possible to the button. This solved the issue but sadly not permanently. 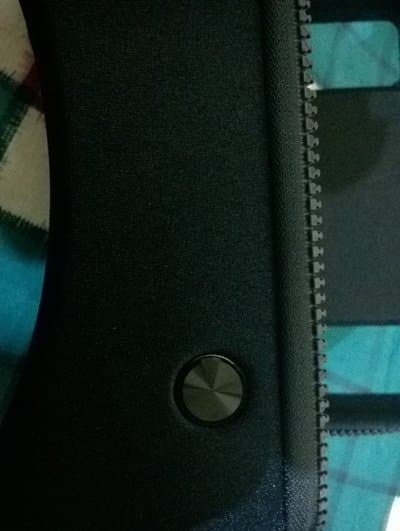 As we said above in the thread, the Mi VR Play Indian version does not have head strap. 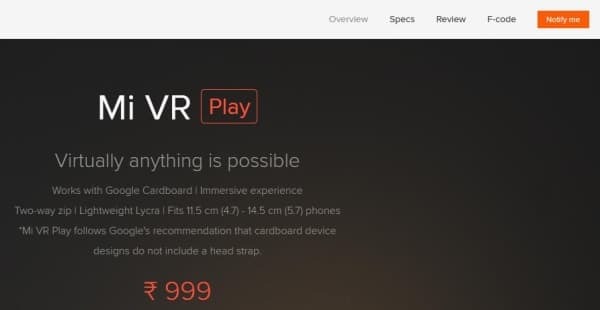 If you do want a head strap for your Mi VR Play, you can buy one from Amazon India. We found one that would work with the Mi VR Play. Sadly one of the pitfalls of this product is that its adhesives are meant to be removable which make it virtually unusable. You can add any permanent liquid adhesive to make the head strap more permanent. 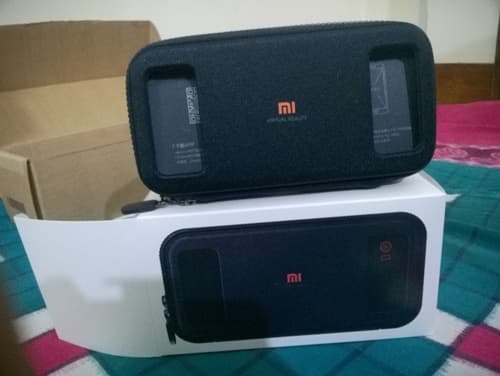 The Mi VR Play is an excellent investment when it comes to VR headsets and if you have been waiting to buy one then go ahead, you won’t be disappointed.